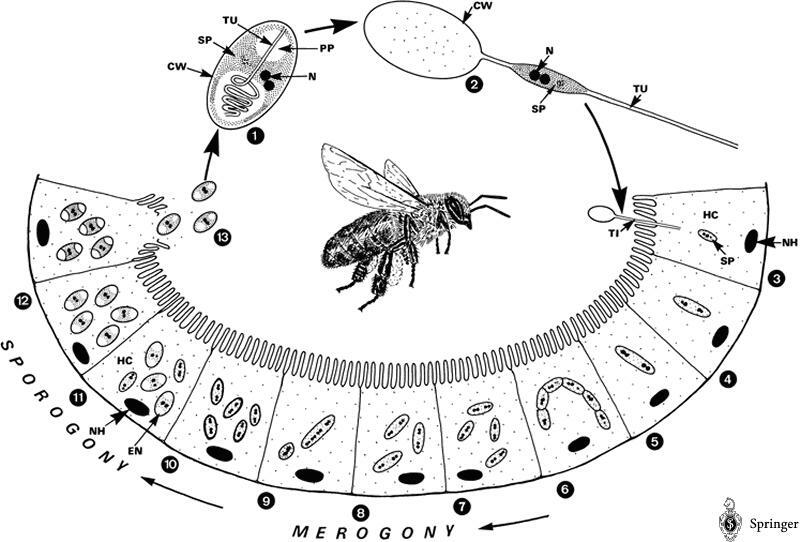 Nosema becomes a problem, however, when newly-emerged bees ingest spores. When this happens, the infection messes up their ability to digest pollen, and thus keeps them from ever developing their hypopharyngeal glands. So how does a “house bee” get infected? This happens when extended cold or rainy weather prevents cleansing flights. But when a bee’s got dysentery from nosema she just can’t hold it. The house bees then say “OhMyGod, somebody’s pooped in the hive!” The insidious thing is that cleanup is a job delegated to newly emerged bees, who then ingest the spores in the process, and the infection thus moves from older bees to the very youngest. When this happens, nosema can go epidemic in the hive, with dire results. Infected queens can be superceded, and unless the newly-reared virgin replacement can fly, the colony will go queenless. “Good old” N. apis requires the bees to spread it by defecation during winter, and does not do well in hot weather (Manning 2007), so it is usually a rather benign parasite, when bees are kept in their normal climatic range. 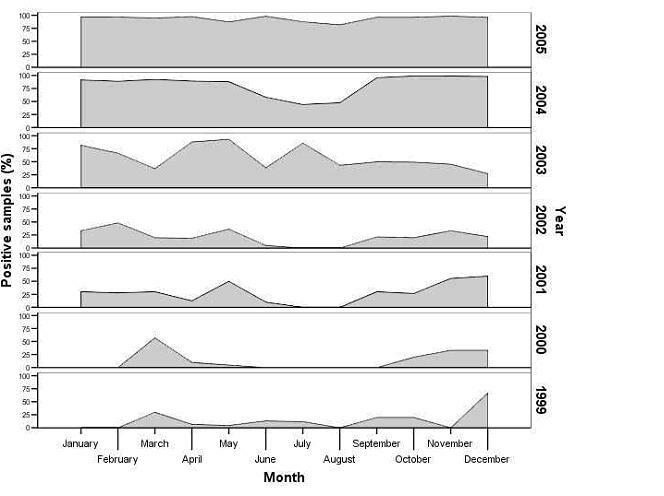 The level of infected bees peaks in early spring, then drops close to zero by June, and stays low until next winter. The yearly drop in infection generally allows the colonies to recover. However, N. ceranae is a very different animal! It appears to peak in summer. As best I can tell, beekeepers in every country where ceranae has been identified have been reporting that they now have nosema problems during summer. Side note: I’m not in any way trying to denigrate the effects of pesticides on our bees, and fully support further research on the subject—especially with regard to the neonicitinoids. So if there is no dysentery, how does ceranae spread from bee to bee? 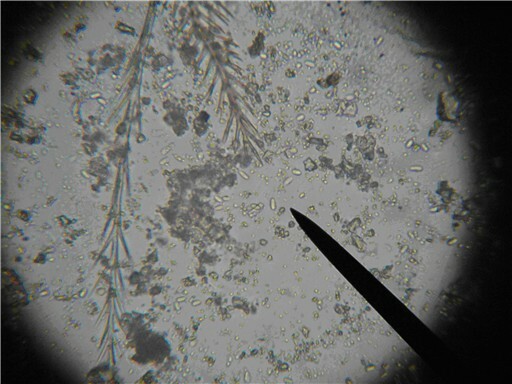 Higes (2007) found that infected foragers contaminate the pollen they collect with spores, apparently when they moisten the pellets with nectar from their crops. This contaminated pollen is then delivered to the brood nest, where it is consumed by young bees. This important discovery could explain why ceranae can be so prevalent during summer. The oldest, most spore-infested bees transmit spores to the food that the youngest bees are about to eat. 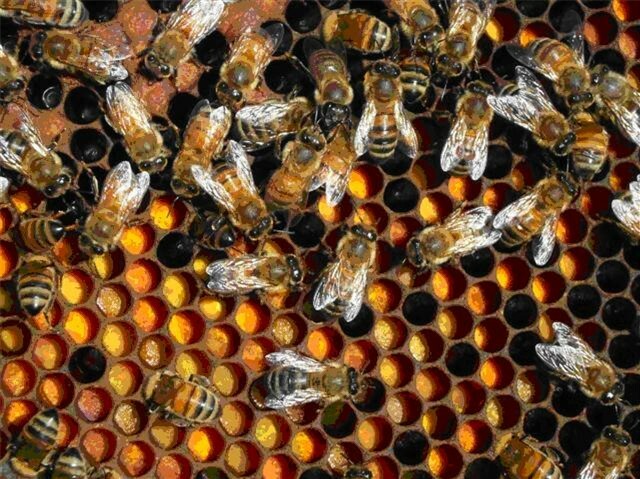 As if this weren’t enough, stored beebread pollen has been found to have virus particles in the various layers (Cox-Foster 2005), so the young bees could simultaneously ingest both N. ceranae spores plus virions. The young bees might be doomed from their first meal! Upcoming: In subsequent articles I will describe management techniques and treatments for nosema, including alternatives to fumigillin. Then I will cover sampling methods and considerations, with a photo essay on simplified techniques for taking spore counts yourself.